Available as a blank A5 Greeting Card and midi print, please see order form. Original mixed media on board A1 sized. Unframed. £775. For someone with a sense of humour! 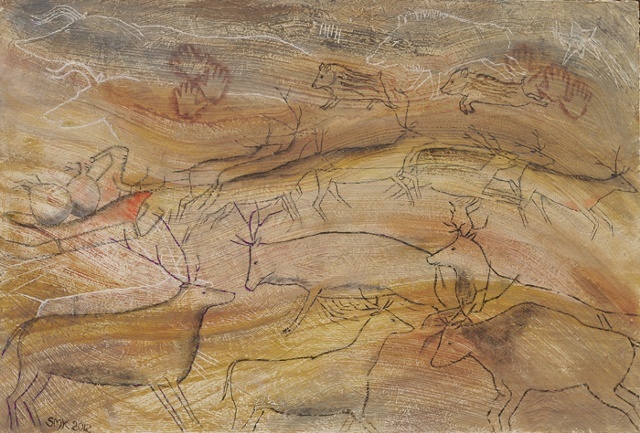 Three cavers made one of the most thrilling discoveries of modern times in December 1994: The Chauvet cave in the Ardeche, a hidden network of caves containing 300 paintings, the oldest example of prehistoric art ever found and aged to 30,000 years ago. Among the mammoths, bears, lions, and rhinoceroses an image of a man riding a sleigh and pulled by reindeer was found. This is confirmed by leading palaeontologists as proof that St Nicholas, or Father Christmas existed in pre-historic times. I have faithfully reproduced him here for your enjoyment.